Slovakia, the republic in the central Europe, formerly a part of Czechoslovakia emerged as an independent state in 1993; joining the EU in 2004 – with its 5.4 million inhabitants making 1.06% of total EU population. 40% of Slovak citizens are living in villages with less than 500 inhabitants. According to the Ministry of Interior the official number of registered non-profits in Slovakia increased from 42,750 in 2014 to about 52,760 in 2015, thus signalling relatively strong dynamics of civic participation given the size of the population. The set, however, is formed by rather heterogeneous groups of institutions and organizations mixing up various legal entities such as church based organizations, health and social care institutions (hospitals established as non-profits), public law institutions (such as public TV, radio, etc. ), political parties, associations of homeowners or trade unions etc. altogether with grassroots civic associations or foundations. The classification of the structure of the NGO sector according to the type of organization shows the following distribution: there are 46,687 civic associations (including homeowner associations, church based organizations and health care organizations), 536 non-investment funds, 1,559 non-profit organizations providing public benefit services, 118 organizations with an international element, 2,984 trade union associations, and 447 foundations. Employing such a broad view for the purpose of official statistics obviously blurs any further analytical consideration based on the official data regarding not only the scope or structure, but, most importantly, revenues and various aspects of financing of non-profits. However, the principal deficit of any analyst’s ambition admitted also by governmental authorities remains the overall lack of relevant, well-structured, either current or past data, on the whole range of important domains e.g. number of non-profits with a single focus area or various financial aspects of the non-profit sector like total revenues or its detailed structure. Especially private resources – donated either from individuals via public collections or direct financial supports of NGOs from corporations – are hard to access. Interestingly, the criterion of tax percentage recipients could help the aim of extracting the subset of grassroots NGOs from the wider set of all non-profits based on the assumption that running for tax designation sources identifies the grassroots organizations with broader public outreach. The eligible recipients of tax designations are defined by the law as follows: civic associations, foundations, non-profit organizations, non-investment funds and church based organizations (except churches themselves). As of 2015, there are 12,577 such recipients officially registered, thus the number provides a guideline for estimation of the scope of the NGO sector in Slovakia fitting into internationally relevant comparative framework. As for the issue of sustainability of the non-profit sector in Slovakia, we can follow the key analytical instrument at hand – the U.S. Agency for International Development (USAID) annual NGO Sustainability Index. According to the score of 2.9 in 2014, Slovakia ranks within the Sustainability Enhanced category; however year-to-year decreases were reported in the legal environment, financial viability, advocacy and infrastructure, thus confirming the ongoing trend of deterioration in the overall sustainability. The roots of the political decision to introduce the tax percentage system in Slovakia could be traced back to the autumn 1998 when Vladimir Meciar had been defeated by the pro-Western coalition led by Mikulas Dzurinda. However, the very first impulse for introducing the mechanism came at the conference in Stupava in 1997 where the representatives of the non-profit sector have initially discussed the newly adopted Hungarian model. The strong contribution of the civil society movement towards Meciar’s defeat made the new government liable for negotiations with the civil sector leaders who, as a legitimate and strong driving force, made the new political elite fulfil their previous political commitment to support the further development of the civil society (let alone the fact of the significant influx of civil society activists into the positions of the newly constituted state and public administration). The initial political consultations between the policy makers and civil society leaders started in 1999; the existing experience with the tax percentage mechanism in Hungary at the time served as a best practice example and it was successfully used as a rather strong argument for adopting the system in Slovakia. The tax percentage system was enacted by the Act No. 561/2001 of Coll. amending the Act No. 366/1999 on income tax on 4th December 2001 by an overwhelming majority of 99 out of 101 present MPs. As of 2002, individual taxpayers could designate 1% of their personal income tax to an eligible NGO. According to the survey 71% tax payers were familiar with the tax designation opportunity in the first year of operation, however only 341,776 individual taxpayers entered the system resulting into a total revenue of 3 381 870 € distributed among 3,826 actual beneficiaries (out of 4,035 eligible). When it comes to the designation of individual taxpayers, we can observe stakeholders´ general support for the model since its introduction, neither political parties, nor civil society or the public ever questioned the model. As of 2004 the percentage had been raised to 2%, and moreover, in 2011 a new amendment was introduced that raised the percentage for individuals who volunteered for at least 40 hours in the previous year – since 2012 such volunteering taxpayer could assign 3% of his/her income tax instead of 2%. This novel addition to the original model was aiming to enrich volunteering with additional incentive; as such it was part of the brand new Act on volunteering which had not existed till 2012. So far, this new addition to the mechanism has not been much used (while the official estimates for the number of volunteering individuals in Slovakia is at about 327,000 in 2013, the same year there were only about 8,000 individual taxpayers using 3% tax designation) as the provision of volunteering services of individuals seems to be taking place independently of the tax designation incentives. Despite the administrative cost of issuing the additional tax form related confirmation letters for the volunteers the legal opportunity of raising the percentage up to 3% remains challenging opportunity for the NGOs to professionalize its engagement with volunteers. In 2004, the tax designation model had broadened its span on corporate bodies. Diverting a portion of a corporate bodies’ income tax to the civil society organizations made the Slovak version of tax percentage system globally unique, different and interesting and therefore in what follows we will deal with the corporate designation in more detail. Let alone the fact, that the cumulative corporate designations revenues are almost double sized comparing to revenues from individuals taxpayers. 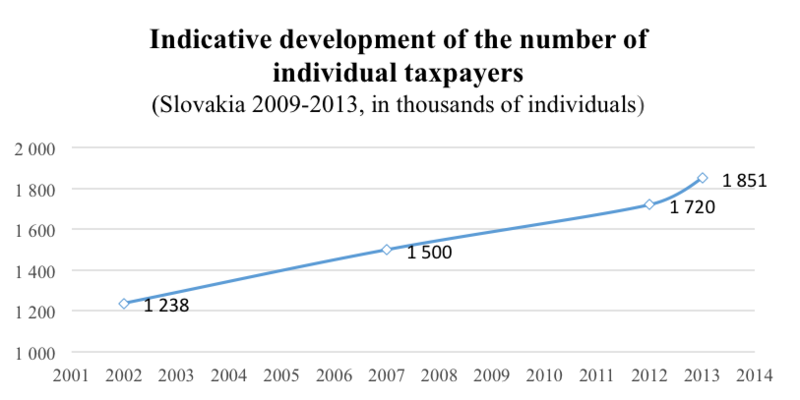 The introduction of the corporate tax designation in Slovakia was a result of a trade-off between the civil sector and the government while adopting the major tax reform (2003-2004) at the time aiming to radically simplify the tax system by reducing exemptions, thus leading also to abolishment of various tax benefits for NGOs including property taxes, VAT and income tax. Most importantly, the tax write-offs for charitable donations from corporate bodies were eliminated as well. The proposed cuts in tax benefits for NGOs and corporate tax write-offs led to negotiations and the subsequent agreement with the Finance Ministry on corporate bodies’ designation, initially fixed at the level of 2% in 2004.
fiscal arguments attacking too high a portion of revenues of corporate designations became particularly strong within the austerity discourse after 2009. The first serious attempt to abolish the corporate tax designations appeared in 2006 with the then Finance Minister Jan Pociatek outlining direct fiscal arguments together with more refined criticism of corporate tax designations as deterioration from the original goal of the system, namely to build relationships between the NGOs and individual taxpayers, thus attacking the corporate foundations’ overtaking the role of excess intermediaries. It was not successful as the NGOs effectively mobilized a broader public support with the campaign Ľudia ľuďom (People to people), moreover one of the government coalition partners (surprisingly above mentioned Vladimir Meciar) took side of the NGOs. The highest revenue from corporate tax designation came about in 2009, which simultaneously became the milestone of major changes in the tax percentage system. The government pushed through the gradual reduction of the percentage for the corporate taxpayers starting in 2010. The NGOs were campaigning again to preserve 2%, this time achieving only a compromise of gradual reduction from 2% to 0.5% during the years 2011 to 2019. Besides the reduction of the percentage the new amendment implemented incentives for the business to engage with the NGOs through a direct financial support from its own profit resources – matching principle. In closing of this section it should be stressed that the process of advocating for implementing and maintaining the percentage system in Slovakia, besides the financial gain, has resulted in successful public campaigns mobilising ad hoc and strategic alliances within the NGO sector as well as with other relevant stakeholders in the field, thus contributing not only towards financial revenues but also advocacy capacities of the whole NGO sector. A tax designation beneficiary in Slovakia can only either be a non-profit organization (predominantly NGO) or, in a smaller scale some other type of organization explicitly listed by the given Law. The organization needs to get registered by a notary on annual basis paying an administration fee of 70 €; as of 2015 there were more than 12,000 eligible beneficiaries. The beneficiary must spend the received funds by the end of the next year following its non-profit mission and thematic focus area. The recipients obtaining the resources of more than 3,320 € are obliged to report the use of received funds in the Commercial Bulletin (Obchodný Vestník) within 16 months from the date that the Tax Authority publishes the final list of recipients. The recipients can spend the resources flexibly upon their own will specifying the given amounts for single purposes. In case the received funds exceed 33,000 €, the recipient is obliged to provide an auditor’s statement that conforms to special regulations. Taxpayers (either individuals or corporations) designate the percentage via filling in a separate sheet of their tax return form. The volunteering taxpayer applying for 3% designation is obliged to attach official confirmation letter from the NGO. The tax authority gradually allocates all the designations to the beneficiaries in question, these obtaining the allocations within 2 to 4 months after the tax return deadline (March 31st). The number of recipients has been constantly growing since the introduction of the model – from about 4,000 in 2002 to almost 12,000 in 2015, which indicates a general popularity among the recipients. As for the providers, the popularity of the model is somewhat similar between both groups: according to the official data, about 55% of individual taxpayers with positive tax due are entering the tax designation scheme. Similarly, about 60% of corporate taxpayers with positive tax due take the advantage of tax designation (for detailed overview see bellow: Figures 3, 4, 5). According to the official data, 10% of individual taxpayers with the highest income allocate more than 80% of overall resources. The analysts of the Institute for Financial Policy have recently expressed their concerns about altruistic solidarity as a leading principle in the decision making of individual taxpayers, arguing hypothetically about the role of acquisitive factors present within individual decision making on the allocation of tax designation. The revenue of an individual taxpayer designation reaches only about 1,1% of its 2% potential – thus the efficient percentage in case of individuals amounts to only about 55% – leaving the rest of the potential revenue (about 16 mil. €) untouched. Such unsatisfactory results are challenging the fundraisers in NGOs to build wider bridges with individual donors via tax designation mechanism. absenting 40% of corporations that do not use the scheme are responsible for lowering of the total efficient percentage; we assume that the relevant portion of these contribute relatively small volumes towards the overall tax revenues. 8% of corporations eligible to designate 2% (under provision of private donations reaching 0.5% of their taxes) are raising the efficient percentage up to the final level of 1.57%. 10% of corporations with the highest income taxes make up about 96% of total corporate tax designation revenue; we assume that the relevant portion of these designate the upper level of percentage available – 2%. When questioning the additional potential of non-profits for raising financial funds through the designations of corporate taxpayers, we need to consider the upper (orange) indicator in Table 4. In contrast to individuals there is no significant additional financial potential left here (about 2,5 mil. €), since 90% of the potential revenue is reached (by about 60% of the actually participating providers). The most challenging issue for the NGO fundraisers remains the mobilization of the corporate tax payers into private giving which could substantially raise the total revenues – first, within applying for higher level of designation available – 2%, second by bringing additional private gifts for the recipients. So far, only about 7-8% of corporations with positive taxes officially declare to match the designations with their private donations. Interestingly, as of 2013 the revenue of NGO sector from corporate private donations was more than a double (about 57 mil. €) of total revenue of corporate tax designations (25,7 mil. €). Such evidence of existing philanthropic capacities among corporations leads towards the hypothesis of inadequate or absent information on tax designation model incentives on the side of the corporate bodies. After 2004, about 60 new corporate foundations were established, obviously due to the allowance of corporate designations; especially big companies (from telecommunication, banking or energy supply sectors) allocate extremely big volumes to the foundations that they founded. For example, 12 corporate foundations were listed in TOP 20 of the most successful recipients in 2014. However, such a concentration of tax designation allocations is counterbalanced by the strict regulations forcing the foundations to spend the tax designation resources within the end of the following year after receiving the funds, which navigates the foundations into professional grant-making. As a matter of fact, corporate foundations became some of the most relevant grant-making institutions in Slovakia, thus overtaking the position of the strong international donors operating in 1990s. The tax designation funds are thoroughly being spent through open grant-making programs. Table 1.: Tax designation allocations: recipients, providers and amounts 2002–2014. Source: the Institute for Financial Policy at the Finance Ministry; the Financial Administration Office; the Ministry of Interior; The author’s own calculations. 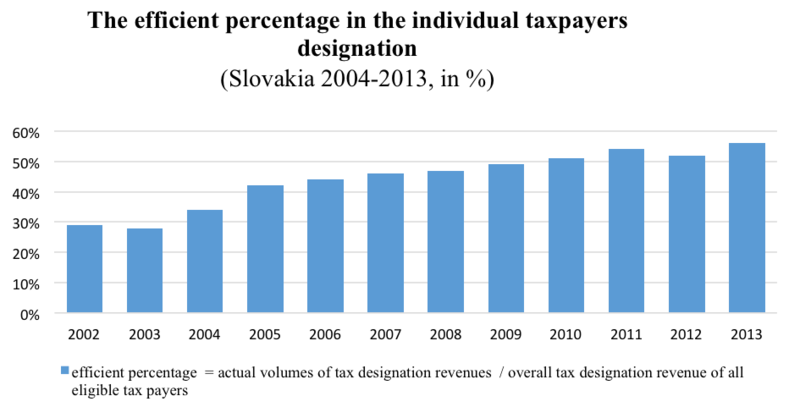 A year after the original percentage law in 2002, Slovakia adopted an innovative system of tax designation unlike any other in the world, where not only individuals but also corporations could opt for diverting a portion of their income tax to civil society organizations. This pioneering system substantially changed the relationships between the NGOs, business and the government leading to an additional revenue for thousands of not-for-profit organizations, better advocacy skills of the not-for-profit sector and proliferation of corporate foundations. At the same time, since its introduction, the corporate designations have become the subject of constant political concerns, charging the system with potential tax evasions, accusing the corporate foundations of supporting PR, marketing and business strategies of their parent companies. To the detriment of many organizations, the model underwent changes during the financial crisis, reducing the percentage in 2009 and simultaneously enriching the model with an incentive to enhance private giving – “matching principle”. However, throughout the decade the corporate tax designation generated substantial incomes for NGOs exceeding € 300 million. The individual percentage tax mechanism has not become the subject of any relevant concern and even higher percentages and a new element of volunteering were introduced. A major untapped opportunity for beneficiaries is the potential of mobilization of almost 50% of the individual taxpayers who do not make use of the tax designation scheme possibility. Kuvíková, M., & Svidroňová, H. (2014). 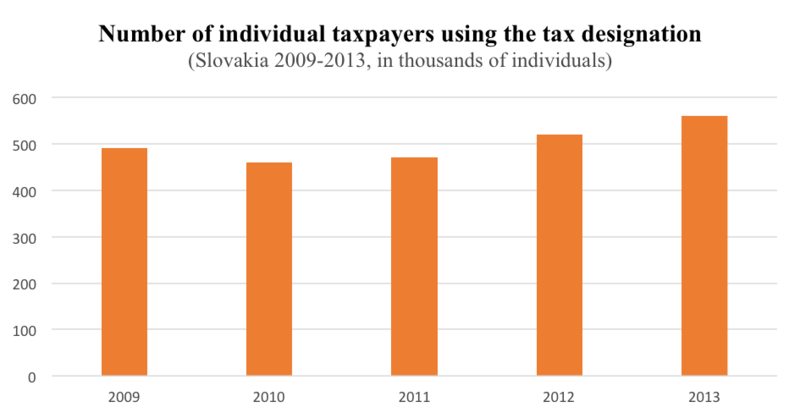 Sustainability and Operation of NGOs Influenced by Tax System: The Case of Slovakia. International Journal of Not-for-Profit Law , 16. Accessed August 16, 2015: http://www.finance.gov.sk/Default.aspx?CatID=10126 (a Slovak site). Hungary enacted the unique tax percentage designation model in 1996. The corporate percentage designations´ cumulative revenue exceeds € 300 million throughout 2004-2015. See Table 2. The list of beneficiaries can be found at www.rozhodni.sk (Slovak site). (Molokač & Hagara, 2015) p. 7. Efficient percentage is a category based on the ratio between actual volumes of tax revenues of participating tax designation providers according to the overall tax revenue of all eligible tax payers. (Molokač & Hagara, 2015) p. 3. A corporate foundation is not a technical legal term in Slovakia, as the Act on foundations does not differentiate the concept of a corporate foundation. We borrow the term from its common language usage which became obvious following the fact that majority of such foundations just simply use the name of its parent corporation.